A unique, complete and balanced extruded kibble product that is rich in Omega 3 and Omega 6, is high in protein with real meat. Catpro Plus is balanced with calcium and phosphorous to promote strong bones and teeth. 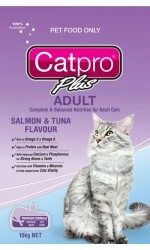 This product has been enriched with the right vitamins and minerals to help support your cats vitality. Catpro Plus Adult Complete is a nutritionally complete and balanced dry cat food made with real meat to maintain the health and well being of domestic adult cats. This product contains only the best local ingredients which are sourced in Australia for their freshness and combined in a way to provide efficient digestion and absorption required for adult cats. Catpro Adult Complete contains all the body building proteins, amino acids and minerals essential for maintaining your cat’s good health and well being. Catpro Adult Complete contains natural vegetable oils which help maintain a healthy skin and lustrous shiny coat associated with a healthy adult cat.